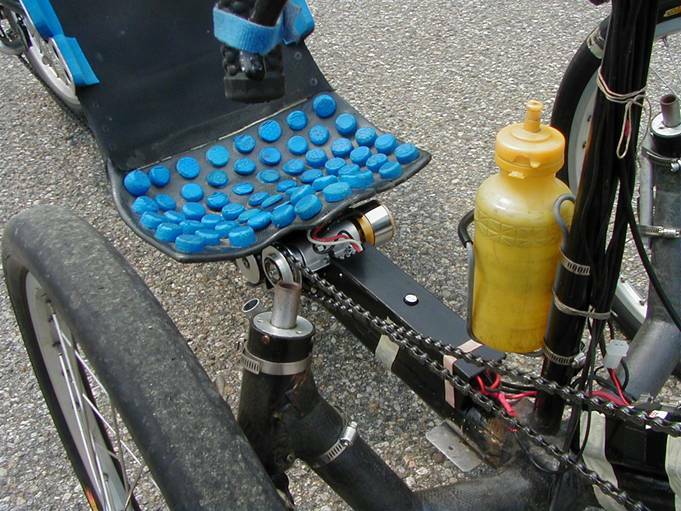 MARS recumbent bicycle and human powered vehicle (HPV) web site! My assist philosophy has been based on the concept of truly low power giving just enough assistance. This then allows for a lighter weight system such that when the assist is not in use it doesn’t detract from the overall efficiency of the vehicle/rider combination. Meaning that the low assist weight requires hardly any additional energy from the rider when climbing or accelerating (a lightweight vehicle also helps). 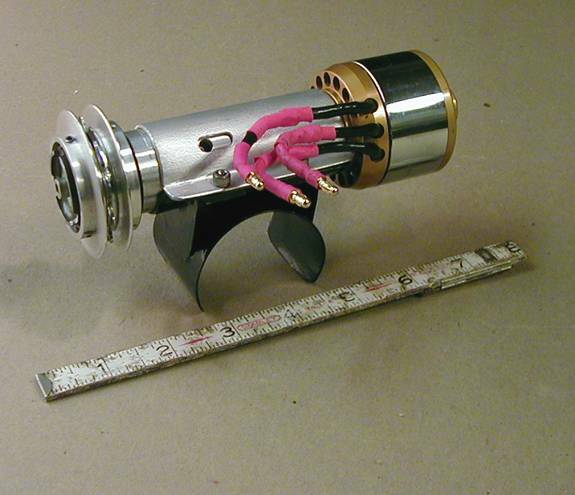 My design goal was around 100 input watts to the motor and less than 10 pounds total system weight. It came in at 4.2 pounds ! -- That’s every thing – motor/freewheel assy/mounting bracket, battery, electronic controls. The numbers (speeds and power) you will see throughout this report will be quite low for many HPV enthusiasts. But what I am designing for is not so much for speed but for reduced effort from the rider. I’m mainly designing for local alternate transportation and for more average people - people who simply don’t have the power capabilities and need a little help. They would include smaller people, women, and us older folks. Photos 1 shows the mounting bracket assembly (that would fit over a 2 inch frame tubing). On the right is the motor. The motor is a TORCMAN Brushless Outrunner model TM 430-20. The motor is rated for far more than what I require but it does have a fairly low KVA, (RPM per volt rating which is around 500). The output of the motor goes thru a 19:1 gear box. On the left is a freewheel with a drive cog. It’s a cut down Shimano freewheel about ¾ inch wide. Modifying a standard freewheel is covered here. This describes a left hand version but for this application a standard right hand drive is used (simpler to modify). In between are two support bearing for the freewheel plus a coupling to the gear box. The system is pulling the chain coming off the bottom of the chain rings. This then allows use of the entire vehicle gearing with minimal change to the drive train. Because the drive is on the low tension side of the chain, the losses are very low when only human power is being used (maybe 1% or so). There is a handlebar mounted push button to turn the motor on. With such low power there is no need for a throttle. Also by design, having to hold the button on encourages intermittent operation (also no power during shifting). The small battery also encourages intermittent operation (intermittent is key for a light weight system). I also have a small potentiometer that can be set for low to higher power (60 to 150 input watts). This helps tailor battery run times depending on terrain and length of trip. Photo 2 shows the motor assembly mounted below the leading edge of a seat. 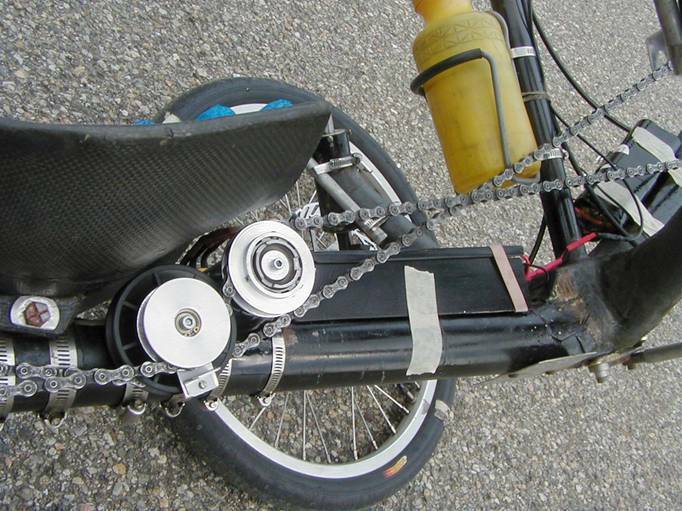 The black box sitting on the trike frame contains the electronics. There is an Electronic Speed Control (ESC)(Castle Creations MAMBA Max) to drive the motor with the proper series of pulses - much like a stepping motor. This is a model aircraft/car ESC which normally requires a received signal from a transmitter. That signal is generated by a small Astro Servo Tester. Included in the box is a small auto relay (Radio Shack) to turn power on. I also have what is called a Flight Data Recorder (Eagle Tree). It records Pack Volts, Amps, Watts, RPM and Temperature which gives a detailed view of the operation, all on a downloadable plot (invaluable tiny piece of equipment). Instead of measuring motor RPM all the time I am measuring vehicle wheel RPM and on the plot it registers vehicle speed. The battery is on the boom in front of the steering post. Its 9 NiMH 4500 cells which weigh slightly less than 2 pounds. I chose NiMH instead of LiIONs because LiIONs are still a bit finicky in terms of charging and discharging. I intend to charge the cells off a 10 watt roof mounted solar cell. I have a 5 watt cell charging my streamliner head light batteries and classic car battery. The choice of a 10.8 volt battery is so I can also charge off a car battery if I’m out on a trip (small regulator required). Here is a view of the drive train side showing the additional idler to get decent chain wrap on the freewheel cog. Note that it is coaxial with the normal tension idler. This is a minimal change to the overall drive train. 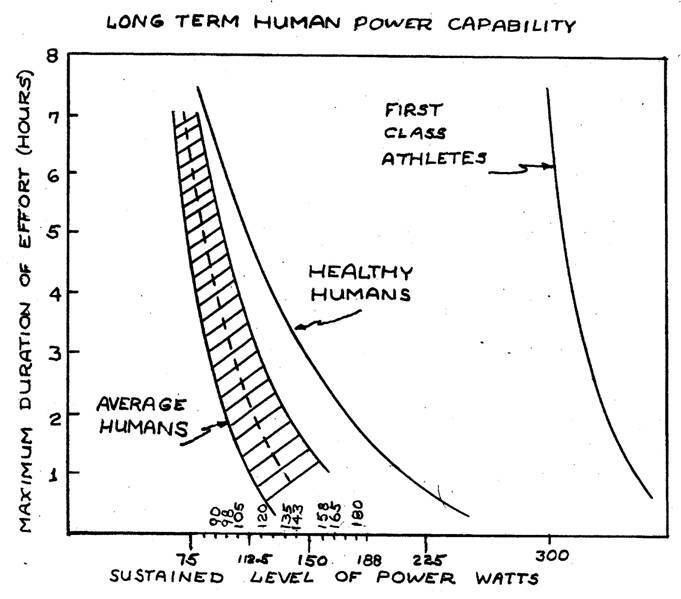 To make more sense out of how power demands affect humans and how such a low power light weight assist system can help, a review of Human Power Capability is in order. Plot 1 shows the graph I used for a ICE Up-Hill assist talk that I gave at the 4th IHPVA Scientific Symposium in 1991. The tested individuals would hold a specified power until such time they could not maintained that power any longer. The Healthy humans are students and military personnel (active young folks). First Class is self evident (amazing power isn’t it) but note how steep that curve is. I added the Average Human curve representing us regular folks who are active but not in training. Our curve is also steep. The steepness of the curve points to how sensitive human are to an increase in power demands. Tiny increases kill us. I used to be more or less on the line going down the center – but I wonder now 16 years later. But let’s use the center line for this discussion. Using this plot as reference we can now look at what a low power assist can do. I did some tests on a 6.3% fairly linear grade of about 1450 feet in length and 100 feet altitude gain. 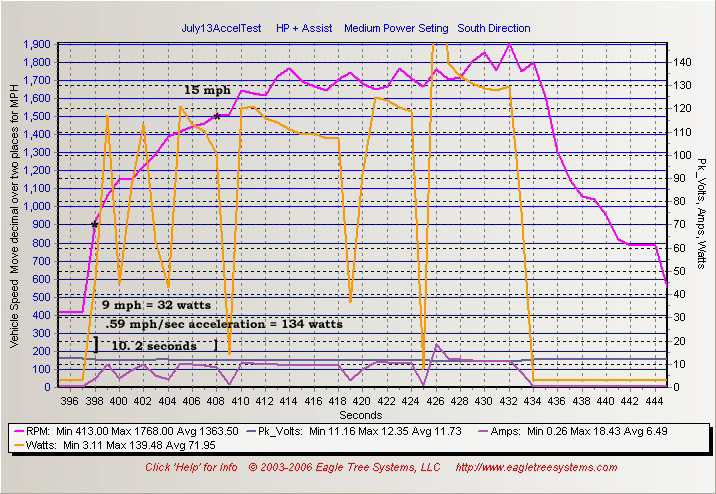 With HP only I can do 4.2 mph which takes 127 watts (using a power calculating spreadsheet PDg on the HPVA web site). 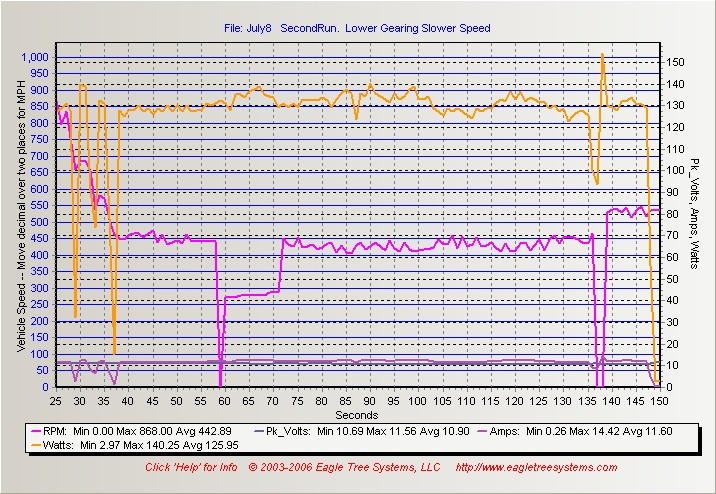 On the HP capability graph this would be around 1.5 hours to fatigue. With the assist at a low power setting the speed is 5.5 mph (30% increase) which the spreadsheet says is a total climbing power of 164 watts which if I had to do this would drop me into some number of minutes to fatigue. But with the assist which is delivering 50 watts to the wheel that reduces my power to 114 watts and ups my time to fatigue to 2.2 hours. 50 watts doesn’t sound like much but this clearly shows how it doesn’t take a lot of help to climb up that steep capability curve. Yes I’m using a long term plot and that short term power does have the advantage of a recuperation period. But peak power slides deeper down the capability curve eventually adding up to fatigue. Just takes a little bit longer. On the road, that help is wonderfully noticeable in the reduced muscle effort along with reduced breathing and heart rates. I couldn’t get Heart Rate data because the RF radiating from the motor/electronics blocked the heart rate pick up. When riding with other trikers that 1 MPH increase in climbing speed opens up quite a gap - I have to wait for them at the top of the hill and I’m much fresher. I ran some tests using only the assist on flat ground and up some grades. For flat ground the power to the motor is such that the vehicle is accelerating. That acceleration power has to be accounted for. On a steeper hill the speed can remained steady. I get numbers in the range from 50 to 55% efficiency. I did some battery run time tests up the same 6.3% grade. 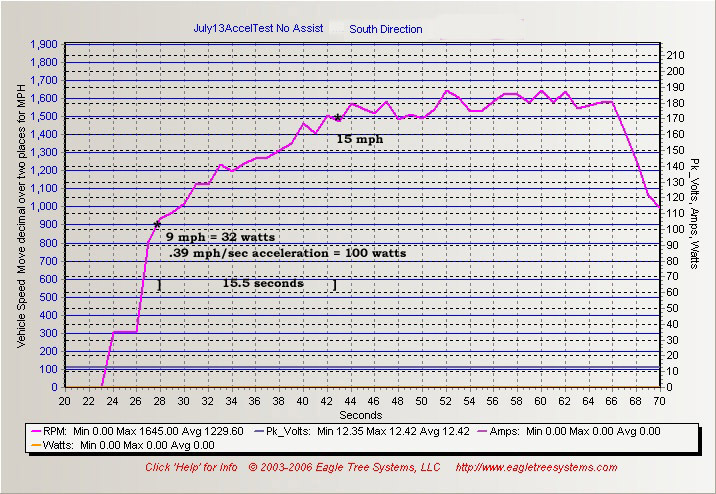 Vehicle speeds/distances were collaborated on a bike computer and a separate datalogger (didn’t have the RPM to vehicle speed worked out yet). There are 8 runs up 1460 feet of distance and around 100 feet of altitude gain each run. The first run was at the lowest pot setting on the handlebar which is around 100 input watts to the motor as described above. The second run is at a higher input power setting and the speed is 6.5 mph and a total climbing power of 195 watts, 60 assist and 135 HP. 195 would be way beyond my max power for any time/distance. With assistance I can put out a bit more power on occasions knowing that I won’t have to reserve myself for peak power demands later on the trip. Third run is same input power but slightly less HP. The speed dropped to 6.2 mph. Assist power 60, HP 127 watts. The other runs are variations on my input power until we get to the 7th run. Here the battery is starting to run down. The speed is slower at 5.8 mph. 173 total watts, with 50 assist and 123 HP. The 8th run I had to shift down one gear and drop speed to 5.2 MPH with a total input power of 155 watts, assist 30, and HP 125. Total battery run time 22 minutes. The Flight Recorder showed a 3800 MilliAmp Hour capacity used which is close enough to the advertised battery capacity (the battery was not totally drained). Quite acceptable for a 2 pound battery. And after 8 up hill runs I wasn’t beat. However, since these runs I have learned a lot more about this type of battery and I should have limited the cut off to 7 runs. This can be done by setting the pack cut off voltage in the ESC. I am collecting data and information on how to deal with these types of batteries and will probably write this up. To see how often I would possibly use the assist I did a 13 mile run over one of my test routes. The route has a total altitude gain of 690 feet. Most are small grades in the 2 to 6% range. But there is a grade of 9.5% that is 792 feet long. The total trip time for the run was 70 minutes and total assist run time was 17.4 minutes or a 25% time use of assistance. Battery use was 2619 MAH out of a total 3800. I had around 6 more minutes of assist run time available which at 25% assist use would have been good for an hour and half trip. Let’s review the operation on that 9.5% grade. Climbing with no assist the average speed was 3.8 mph. The SS says that is 162 watts or a time to fatigue for me at some number of minutes. I know the feeling of a heavy push on my legs, high heart and breathing rates. My HR monitor said I was up to 140 bpm which is getting up close to my red line. The times from 25 sec to 37 seconds are down shifts. The steepest part of the hill is from 40 seconds to 136 seconds. With assistance the speed is 4.4 mph (Purple). That speed dip at 57 to 72 seconds is a drop out from the speed pickup not the vehicle. Haven’t been able to figure out why this is happening. Motor input power 130 watts ( Orange) or 65 watts to the wheel. The SS says 188 watts needed to climb this hill, so that translates to 123 watts HP which means the time to fatigue jumps from minutes to 1.5 hours. Acceleration is another power demand on the rider. Although it’s a short length of time the increase in watts is significant. And it happens over and over during a trip - each time, the rider dips into their reserves. This plot shows HP Acceleration test with no assist on fairly flat ground. I use the section of curve from 9 mph to 15 mph. At 9 mph steady state, the PDg SS says it takes 32 watts. Going from 9 mph to 15 mph in 15.5 seconds equals 0.39 mph/sec acceleration rate. The SS then shows the power to be 100 watts. 32 to 100 watt increase is a big change. This plot shows HP acceleration with assist help thru 2nd thu 4th gears. during the same 9 to 15 mph but in 10.2 seconds. This gives 0.59 mph/sec acceleration or a power of 134 watts. The assist delivers 55 watts to the wheel. The HP turns out to be 79 watts. I tried to pedal at the same effort that I used for the non assist run but it appears that I didn’t do that. 79 watts is a lot less than the 134 that would have been required. The speed does not increase after 414 seconds because there is about a .26 % grade. That grade costs 130 watts of sustaining power at 15 mph so that’s subtracted from the acceleration power which drops the acceleration down to around zero. You will note the power to the motor climbed at the 422 second location after I shifted into 7th gear but is so short that there is no apparent acceleration. At 430 seconds there does show some acceleration and that also coincides with the grade leveling off. Another input variable is I might have changed my HP seeing I was close to the end of the run. With all these variables these plots are simply to show approximations of the kinds of power required. I use the assist quite often thru the gears to get up to speed when I do my errands. These are generally 3 to 8 seconds motor runs. The feeling of getting acceleration help is terrific and a bit addictive. Because I haven’t used extra power to accelerate I am fresher so I can maintain the cruising speed a bit longer If the sustaining power required is too high and the speed begins to fall off I push the button and within a number of seconds climb back up to speed. Or if there is a short terrain rise I push the button to maintain speed over that rise. Meanwhile all thru this operation my body is only producing the sustaining amount of power. Knowing you don’t have to produce acceleration power can translate into increasing the cruising power a bit so cruising speed can change from 15 mph (84 sustaining watts) to around 17mph (110 watts). Assistance is not as noticeable at high speeds particularly if acceleration is needed because the amount of total power required is high and the assist percentage is low. But I find that speeds up to the low 20 mph range fits well with human capability and assist power. The assist simply takes the peak demands off the rider. Some people may not like the chain drive system pulling the feet around. With such low power this pull from the assist is so small that it’s not annoying. You quickly learn to be pedaling before hitting the button. I have seen some short but high current spikes in the 60 amp range if engaging the assist too early. 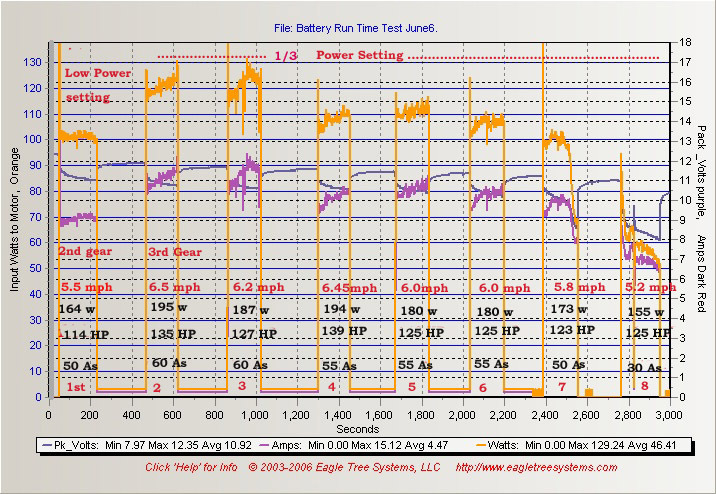 These current spikes do nothing for acceleration but put a high demand on the battery. Some chain drive assist systems have a freewheel on the cranks so the rider doesn’t have to pedal when the assist is on. That may be ok for a higher power assist (higher weight), but when the assist is in the order of 50 watts to the wheel that’s not enough to get the weight of the vehicle and rider going. If the rider pedals all the time the HP is low, the assist power and weight of the system can be considerably lower adding up to an elegant high bike/human efficiency. I could have included a circuit that sees if the chain rings are turning properly which could then send a signal to the electronics to turn on the motor. I didn’t do this because I already have a very sophisticated computer on board. It knows when to turn on the motor plus it can anticipate needs depending on the up coming shape of the terrain. It knows when to shift gears, and it can pre-estimate how much assist to use on a longer trip depending on what kind of assistance will be needed overall. And this computer is packaged in a fairly small space. That computer is called the human brain. Hard to beat. I am very pleased with the design and performance. But I do wish the noise coming from the Motor/gearbox was lower - can’t sneak up on someone. I tried wrapping the gearbox in rubber but the torque is so high that the aluminum cover clamp (in the photo) has to be so tight that the noise reduction is minimal. I had to make a torque limiter bracket on the motor/gearbox because it would slowly crepe around (it has three electrical leads). A slower rotating motor would reduce the gear box ratio but the game here is the motor efficiency may fall off faster than the gain from less gear reduction. Slower turning motors also often mean larger diameter and may result in difficulty fitting it in tight spaces on a bike (like under the seat in my case). One concern I do have is normally on my short 5 to 10 mile errand runs I purposely do strong HP acceleration out of intersections and stop streets as a way to do mini interval training. If I use the assist for acceleration help it is thrilling but in the long run I may be loosing muscle tone. From past experiences my 6 pound IC assist weight could felt (with and without that weight) mainly during acceleration). The range on the IC is fantastic and is terrific for long distance tours where-as the E technology can’t compete (within similar weights). But the IC system can not be turned on/off instantly so the E system has a greater advantage for local alternate transportation needs. Even though the 4 pound E weight can be felt it’s a rather small reduction in human/bike efficiency in exchange for a pleasant amount of help when needed.